Well, here it comes.... The Firebird International Raceway's Annual Monster Truck & Jet Jam!! 10 Monster Trucks, Big Foot, Maximum Destruction, Bounty Hunter, Iron Outlaw, Hot Wheels, etc.. and 6 jets. On Thursday, we took the Invader out to the Gilbert Town Square for a meet the driver event. Big Foot, Hot Wheels, Maximum Destruction, and Bounty Hunter where also on display. Local radio station KNIX (country) had contest to give away free tickets to the event. Saturday came around, and after I had finish work (Military Drill Weekend - Hope you all felt safe), we were off to the track. After setting up and prepping the Invader, we pulled up to the Driver's party. 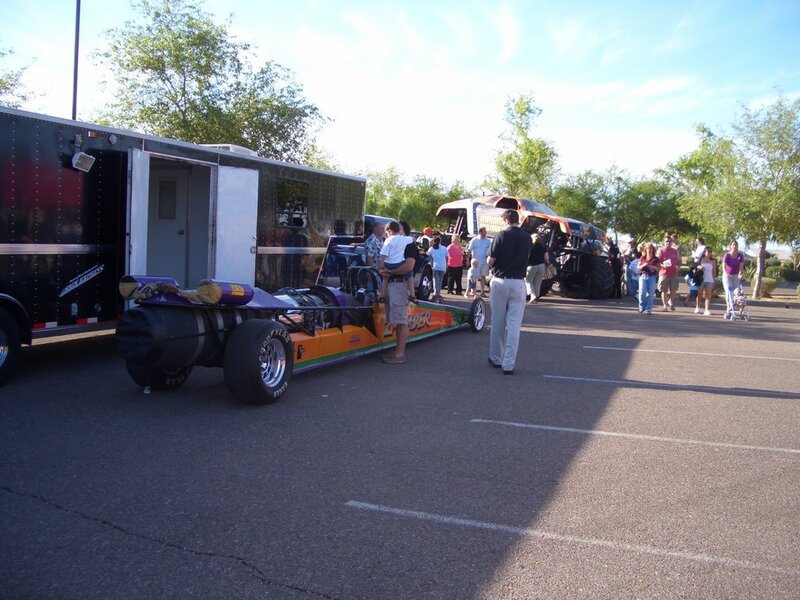 All 10 monster trucks where set up and 5 of the 6 jet dragsters. 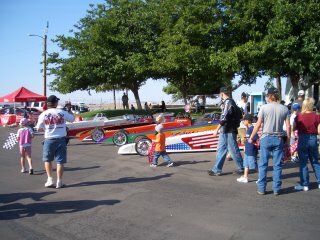 The jet dragsters running were Joe Zaccaro's White Lightning, Joe Zaccaro's Terminal Velocity driven by Tony Franco, Bob Goettel's G Metals Dragster, Joe Douthit's California Smokey, Mark Steven's Earthflight, and the Invader. The second pair was Tony in the Terminal Velocity car vs the Invader. This was going to be the first pass on the Invader with the new engine. Not really sure of the power of the engine, we put a conservative tune in it. After putting on the fire show both cars staged, but I was a little slow on the tree, Tony was out on me. The Invader was reeling him in but not quite fast enough. Tony's winning 5.76 against my 5.69. Can you say, SLEEPING! Tony had a shut down fire at the other end and his starter failed. He was going to try and repair it back at the trailer. After looking at the data, we felt the engine was strong enough to put a stronger tune in it. The tune we had originally put in was for about a 5.90! Bob & Joe Zaccaro where the final pair for the first round. 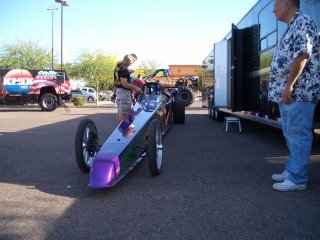 Bob put on a blistering 5.40's pass in the 287 MPH range, while Joe is still working out some new car bugs. With the jet cars turning for the final pass, the crowd was entertained by the monster trucks doing doughnut and wheelies on the track. 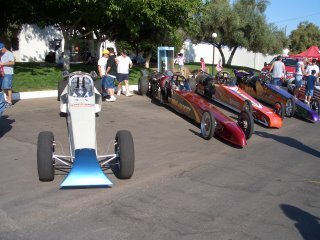 With all the cars prepared except for Tony's starter, the 5 remaining jets pulled to the line. The monster trucks finished and the track crew went out and cleaned and prepped the track. The first out was the California Somkey vs the Earthflight. From where I sat, they both put out a large fire show, but I don't know who won. (I was strapped in the Invader) Joe Zaccaro ran a single with the White Lightning, while Bob & I finished getting ready. 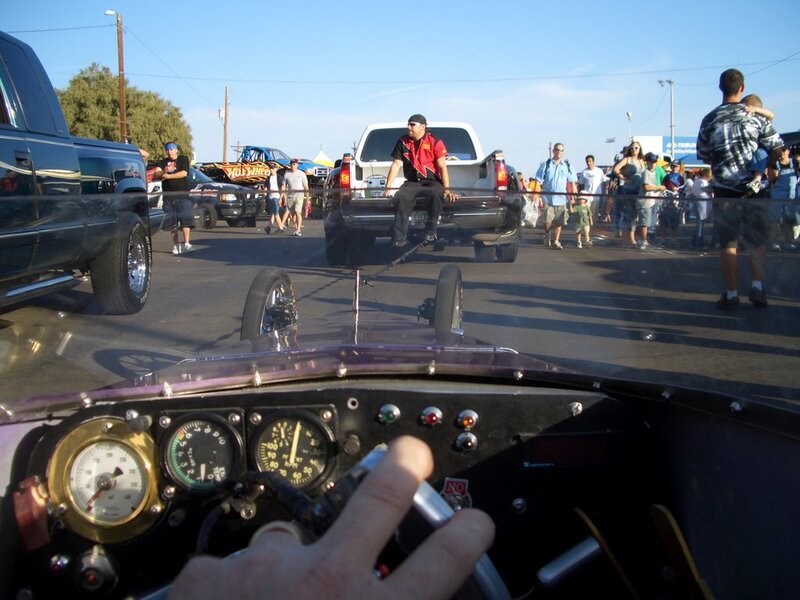 Bob & I pulled up and started, both doing the low power show, but as I increased the throttle the response was not there. Pulling in to the lights to stage, I was hoping it was an air bubble. When the lights came down, Bob hit the burner, I hit the burner, Bob was gone, I was not.... the Invader slow rolled down the track. So much for a stronger tune! Back to the shop to do a little troubleshooting and we be back soon.